Bruce Springsteen performs at an outdoor campaign rally Nov. 2, 2008, for then-presidential candidate Barack Obama at the Cleveland Mall, in Cleveland, Ohio. 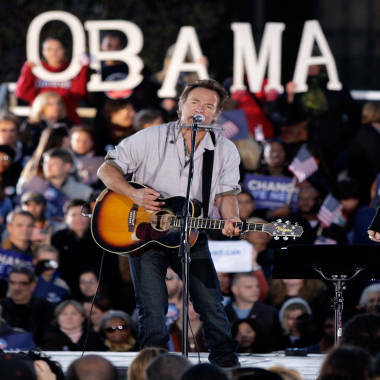 Bruce Springsteen will hit the campaign trail on President Barack Obama's behalf. The musician will join former President Bill Clinton at a free rally in Parma, Ohio, on Thursday, two days after the second presidential debate. Obama will not attend the rally. Springsteen will also do a separate event Thursday. Campaign manager Jim Messina said in a statement reported by The Washington Post that Springsteen echoes the values the president is fighting for. He added that Springsteen's appearances will help get out the vote efforts in Ohio, a swing state whose 18 electoral college votes are considered crucial. Springsteen campaigned for Obama in 2008, but this is his first political appearance of the 2012 cycle. The president uses Springsteen’s song, “We Take Care of Our Own,” in his 2012 campaign song playlist at rallies, the Post reported. Clinton has become an increasingly prominent surrogate for Obama, campaigning for the president in several battleground states. Clinton and Springsteen's joint appearance in Ohio underscores the importance of the key swing state. Polls show Obama with a slight lead there over Mitt Romney, but the Republican presidential candidate is spending an increasing amount of time and resources in the state ahead of Election Day.